Finnish boutique amp company Bluetone has released a Swiss Army Knife-style lifesaver for valve amp users on stage and in the studio. The Bluetone Load Box (370 €; incl. 1.5 metre speaker cable) is a professional quality dummy load (100 W/8 Ω) in a very compact format (only slightly larger than a big paperback) that doubles as a DI-box for guitar amps. As any valve amp user should know, using an amplifier with a valve-driven power amp without a speaker (cabinet) connected – unless expressly allowed by the manufacturer – is a surefire path to disaster. The results of driving an amp without a speaker load can range from the output transformer catching fire to larger-scale component meltdown inside the amp, depending on the volume levels the amplifier is played at, and how quickly the fuses react. This is where load boxes – also called dummy loads – come in. 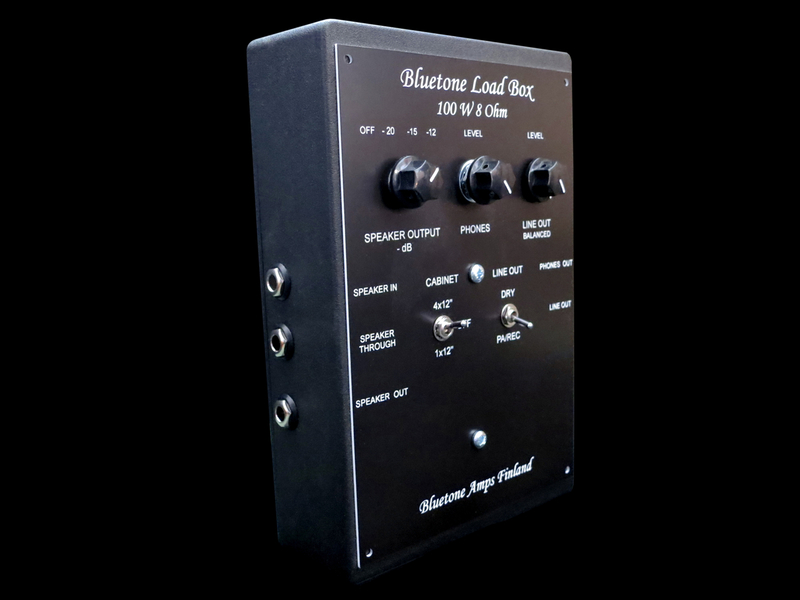 A load box allows you to run a valve amp safely without any speaker connected, while usually also offering signal attenuation and/or line level outputs. As a result, you are able to direct inject any amp into a PA system or recording equipment, as well as running the amp at full tilt without blasting everybody off the stage. Doing away with the speaker (cabinet) isn’t as straightforward as you might think, because the impedance stated on a speaker is only nominal. The speaker, being an electromechanical transducer, behaves in a frequency- and signal level-dependent way, which results in dynamically shifting impedance values. This means that a dummy load is a much more involved design than just a few resistors thrown together. 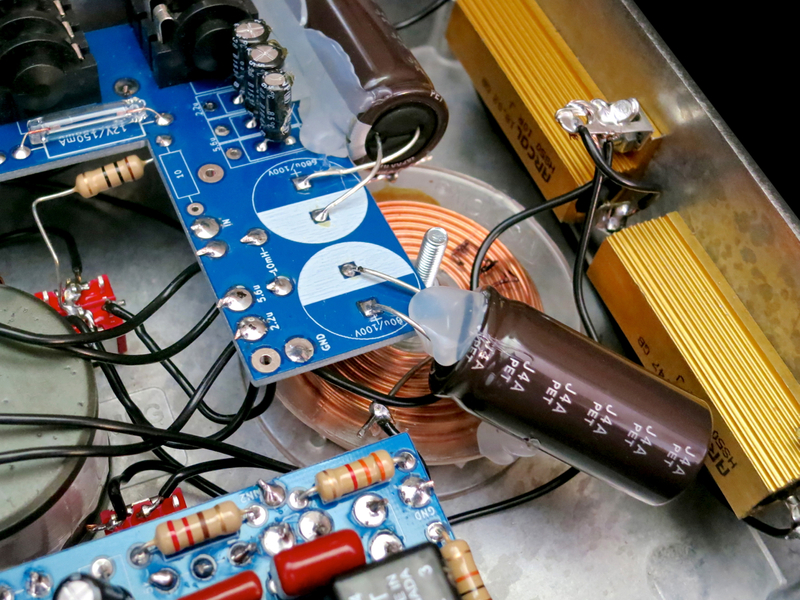 Dummy coils, and a heap of capacitors and resistors are needed to simulate realistically the behaviour of a speaker, to attenuate the speaker signal (by dissipating part of it as heat), and to produce a quality DI-signal. The left side carries all speaker-related connectors, offering an input, as well as both an attenuated output (Speaker Out) and a straight speaker output (Speaker Through). Why would anyone need two speaker outputs? The answer is simple: If you want to run an isolated cabinet backstage at full speaker output for the FOH engineer, and an attenuated speaker signal for the backline to keep onstage volume levels manageable. The right side sports two output jacks – one is carrying a headphone signal, while the other one is the balanced output for connection to a mixing console or a soundcard. Top left is a four-way rotary switch for speaker attenuation, with ”Off” muting the Speaker Out signal completely. I should also mention that you can use the Bluetone Load Box without any speakers connected, regardless of the selector setting. The middle knob is the headphone level control. Because the Load Box is a completely passive design – meaning there’s no need for any sort of power supply – the output level of the headphone output is directly dependent on the signal level (and wattage) of the connected amplifier. On the early production model used for this review the headphone signal can be a tiny bit on the quiet side, when using a low-wattage amp and power hungry headphones. This is a known issue, and Bluetone will increase the signal level in future. The line level output offers a healthy output levels. If you need an XLR connector for the Load Box’ balanced output, Bluetone offers a handy adapter for 20 €. A three-way mini toggle gives you two different types of cabinet simulation – 1 x 12″ and 4 x 12″ – while its two-way counterpart makes it possible to bypass speaker simulation for the Line Out signal. 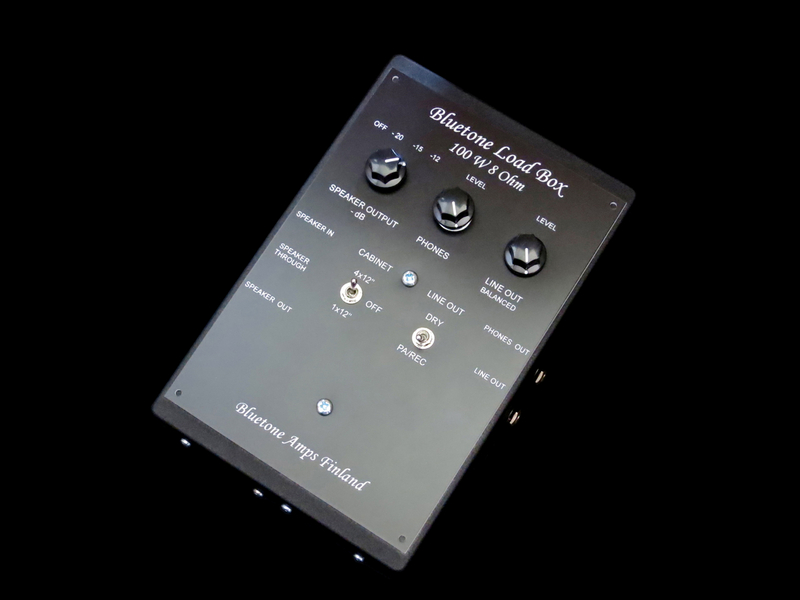 The Bluetone Load Box’ dummy load and attenuator work really well in dropping volume levels while keeping virtually all of your amp’s tone intact. Now you can run your non-master volume valve amp at pub-friendly levels, without sacrificing your sound. Bluetone’s DI-output captures your amp’s tone without the need for a speaker cabinet and microphones, which is great news for home recordists and small project studios. The Load Box’ analogue speaker modelling offers a fine solution for capturing your sound with the least amount of fuss. In my opinion the Bluetone Load Box offers great value for money. 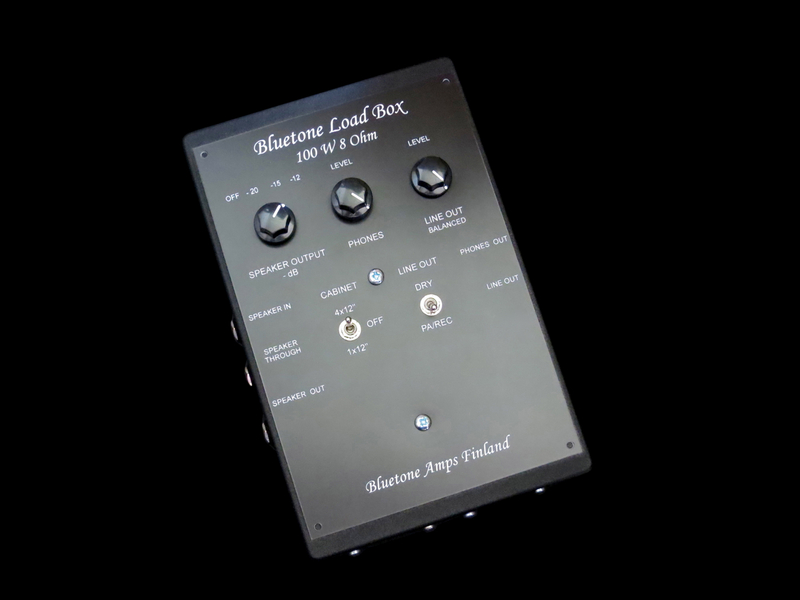 Bluetone’s compact Load Box is a product every owner of a valve amp that doesn’t come with output attenuation built in should at least consider adding to his/her equipment. The clever bit is how Bluetone has managed to fit the different functions into a lightweight, easy-to-carry, handcrafted piece of equipment. The Load Box is a sturdy device that will get the job done with the minimum amount of fuss, and it comes at a fair price.